WASHINGTON – In less than 24 hours Israeli voters will head to the polls. Prime Minister Benjamin Netanyahu, who is known internationally as a hard-liner regarding Israeli settlement expansion, is seeking continuity in the office he has occupied consecutively since 2009. His first stint as prime minister took place in the mid-1990s. Prospects for re-election hinge on Netanyahu’s center-right Likud party forming a coalition with other right-leaning parties that is strong enough to withstand a challenge from the Israeli left to maintain a majority of the seats in the Knesset (parliament). The Netanyahu government’s use of concerted military force in response to terrorist attacks on Israeli civilians and its decision to erect a wall to prevent Palestinians from entering Jewish settlements has not gone without criticism. And much of that criticism has come from the political left. Some progressive activists have even compared Israel to apartheid South Africa. The Netanyahu government is strongly supported by President Donald Trump and congressional Republicans. But Democratic attitudes toward Netanyahu range from lukewarm to highly critical. Last month all of the 2020 Democratic presidential candidates skipped the traditionally bipartisan American Israel Public Affairs Committee (AIPAC) annual conference in Washington. AIPAC is the most influential pro-Israel lobbying group in the U.S. Among those who skipped the conference is former Rep. Beto O’Rourke (Texas). O’Rourke garnered headlines Sunday after describing Netanyahu as a “racist” in a speech to Iowa voters. Did Beto go too far? TMN spoke with political analysts and asked their thoughts. “I can’t speak for Beto O’Rourke. I think the Democrat-left is out of control,” said former Minnesota GOP senator and Republican Jewish Coalition (RJC) National Chairman Norm Coleman. Richard Vatz, a professor of political persuasion at Towson University in Maryland, said O’Rourke’s remarks about Netanyahu are further evidence he is not prepared to be president. 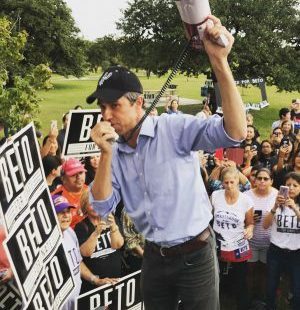 “This is why O’Rourke is not ready to serve as Democratic nominee for president, or, of course, as president,” Vatz said. Tom DeLuca, a professor of political science at Fordham University in New York City, declined to comment on O’Rourke’s remarks but said Netanyahu is a hindrance to an Israeli-Palestinian peace agreement.